I've run in Central Park a few times and have always marveled at the number of runners. However, on all of my ventures, I've stayed on the popular Loop Road, because it seems difficult to get lost on and is six miles long, like many of my workouts. However, this new inteactive map from the NY Times points out all of the major trails, including what appears to be a more scenic "Tom Kelley Loop." I'll aim to hit that one next time. Don't tell my legs, but I ran over lunch today. I went to the park, but rather than hit the hills and technical trails, I went to this area where there's a 1/3 mile loop in the woods with one tiny hill. I ran the loop 9 times, very slowly, very quietly, not once letting my legs know we were running. When I wake up at O-my-God-o'clock tomorrow, I really want my legs to think, "Gee, after our rest day, this won't be bad!" I've got 4 days behind me this week, 1 very short 3miler today and then 15 on tap for tomorrow morning with Dave. And that will mark my first six day running week in a very long time. I'm still 19 weeks out from the marathon and the plan I'm going to follow is Bart Yasso's from his new book, which I highly recommend (the book - the plan I won't be able to recommend for at least 19 weeks), but that's a 16 week plan, so I have these three weeks where I'm simulating the plan, but not really. My body's definitely able to handle the Yasso mileage, but what I need to do over the next three weeks is get used to six days in a row of running. In addition, I spent several months doing all aerobic work and I'm working on getting my body in the hard-easy rhythm of serious training. * Hands-down, the greatest thing for me was to see the two most important coaches of my life. Their enthusiasm and passion taught me much, and it thrilled me to be able to catch up with them. * I was suprised to learn that the cross-country program has had only 5 coaches in 42 years - 4 of whom were there today. * I was also to be surprised by Brett Shelton showing up. Brett was only a year behind me and drove all the way down from Corning, NY just for the meet. We were the only two representatives from the 80's. 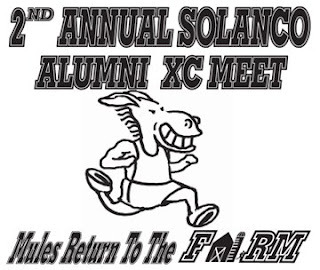 Tomorrow is the the Solanco Alumni Cross Country Meet. I'm a Solanco Alum, so I'll be there. I haven't run on the high school course in 20 years (!!! ), and I know from my few visits to the school that the landscape has changed, so I've got no idea what to expect, terrain-wise. Likewise, I've got no idea what to expect competition-wise, either. I'm not expecting to see many (any?) guys I know, as the 86-89 crowd seems to be either not local or running these days. Last year's alumni run seemed to include a lot of faster kids in their college days and a slower group of guys from the 70's who had some awesome times back in the day... The 80's, though, were largely unrepresented, which is a shame. To make up for it, I plan to play Guns-n-Roses Appetite for Destruction on my way to the meet. Non-existent. I ran competitively in high school and college and quit cold turkey for 14 years. There were some years in there when I know for a fact I didn't run any further than to the mailbox in the rain. Understand this, too: my driveway is short. I tend to be rather even keel about my racing. I don't live in the glory of the good ones very long or lament the bad ones very long, either. In the end, though, I think I'm most satisfied when I execute on my plan - whatever plan that is. Certainly, my marathon was big, accomplishment-wise, but I can't say it gave me much more satisfaction than a lot of other ones. Several months ago, Jerry asked for my opinion about a clause in the Medtronic Global Heroes program that prevented diabetics over the age of 40 who've had diabetes for more than fifteen years from even being considered. As is typical of me, my response was angry and long. Here's a big shout out to Team Type 1, which just finished second in this year's RAAM (after winning the team division last year). I first watched the RAAM on Wide World of Sports in '88 and have paid at least casual attention to it ever since. The fact that Team Type 1 - which is made up of all diabetics - can perform so well in this event is a testament to the individuals, their support crew and the technology provided by their sponsors. Well done! Well that was rather painful. Yesterday was Smith's Challenge - a 10k romp through the County Park trails, which consist of a lot of single track, large rocks and burn hazel. There were also two water crossings - the first to mid-thigh and the second high enough to make one worry about leeches. Because I had the Garmin on auto-stop, it missed a couple points (and seconds) where the brush and the water slowed me down so much that the 405 thought I was catching a snooze, but you can check out the link with most of the action here. Garmin note: using auto-stop during a race is obviously a bad idea. Took the 405 for a spin over lunch over at the county park where I'm racing this weekend. Though some bloggers real that Garmin has over-stated the smallness of the watch, I don't think anyone has pointed out the lightness of the 405. On my wrist, it feels lighter than my Timex - unlike the 305, which feels every bit as big as it is. Anne and her pals at Triabetes have a nice video out... almost makes me want to swim again. Almost. Check it out here. As I write this, I have a new Garmin 405 dangling from my wrist... It's all charged up, set up and ready to roll. Alas, I'm about 3 hours from my lunchtime run, after which I'll post a mini-review. 1) I'm glad I have girly wrists. It fits me perfectly - and I think it will fit most twiggy runner wrists. But not water polo wrists. 2) The navigation is easy - not super easy - but easy. But it took me a while to get used to the 305, too. 3) It found a satellite indoors in about 20 seconds... around these parts, my 305 used to take about a minute outdoors. 4) It's small enough to get away with wearing a watch, though barely. It's the same width as my Timex, but the face is twice as thick. Chunkier, but not overly so. Nearly a week without a Garmin - no surprise, but I'm lost without GPS. Ha, get it? Garmin will fix the out-of-warranty 305 for $99. The repair will come with a 90 day warranty. However, new 205's/305's can be had for $150-ish, so that doesn't make sense. However, the diff. between a 205 and a 405 is $150, so the question isn't really should I spend $300 for a 405 - more like, "Should I spend $150 more for a 405 over a 305?" Garmin 405 in My Future? As impressed as I was with the Garmin 405 introduction, I'd planned on waiting to buy it... First off, I had a perfectly fine 305. Moreover, some of the reviews indicate that the first batch might be a bit wonky. But then last week, the screen faded out at the end of a run and today, it completely faded out mid-way through and hasn't come back since, despite a full recharge. The prognosis isn't very good. I'd bought the 305 online but don't want to risk an online retailer for the new 405. Coincidentally, I'd gotten a postcard from my favorite local retailer who's having a tent sale next week. I called them up and - sure enough - they carry the Forerunners and they have the 405. I'll give the 305 five days to repair itself and - if not - I'll be picking up a 405. Not because I have three hundred clams burning a hole in my pocket, but because I'm truly in love with the Forerunners - even if they only last 14 months, as my 305 has. I'm at the point in my life where I'm a little embarrassed to be a baseball fan. The game has changed so much and the players have changed so much and there are so many ways to spend our time today that watching a bunch of overpaid babies chase a little white ball around doesn't seem to be a good use of my time. And yet, most nights I spend at least a little time keeping an ear or an eye on the Phillies. I feel guilty when I do this, though - as if I'm still holding a torch for a girl that stopped caring what I think a long time ago. And then Jimmy Rollins goes and does this. Does something wrong and deals with it perfectly, immediately. Doesn't act like a spoiled rich guy or that he's entitled to play however he wants. In a day and age when we don't read stories like this, I found it outright startling. And for me - well, it'll make me feel a little less guilty about watching the ballgame tonight. So, I'm in a hurry to go to bed last night around 11 because I need to get up @ 5:30 to go speak in DC. So I take off the insulin pump, take off my clothes, put on what passes for pj's in my life, brush my teeth and go to bed. Notice the part where I didn't put my insulin pump back on? Yeah - neither did I.
I wake up at 3:30am, figuring I'm just nervous about oversleeping my early wake-up call. I go to the bathroom and go back at bed. I sleep fitfully, realizing I don't feel so hot. Nerves? Nah. Around 4:30, I'm feeling really queasy and think - hell, am I getting a virus on a day I have to give a speech? No way! So I stand up to go to the bathroom again. When I do, I rub my belly because don't we all do that when we wake up in the middle of the night? It's at that time I realize my pump isn't plugged in. Here I am leading a mini-pack to the finish line. Please note that I am out-kicking both my neighbor (34) and the local weatherman (404). And - here's an exclusive for Marcus Grimm fans - VIDEO COVERAGE! Buddy Dave's wife had her video camera at the event... The Youtube version is kind of grainy in a grassy knoll sort of way but you can feel the breeze as I put away the weatherman.